This month's issue of Wired Magazine contains a great cover story by Chris Anderson titled "Free! Why $0.00 Is the Future of Business"
I think Chris does a wonderful job describing the rise of "freeconomics" -- and is a must read for people thinking of shrinking a market. It appears that "FREE" will be the title of Chris Anderson's new book, due out in 2009. I'm going to place my pre-order today. Bill Gates gave a demo of Xobni (a First Round Capital portfolio company) yesterday at the Microsoft Office Developers Conference, calling it "very very cool" and "the next generation in social networking". Video below. If this post from ComparisonEngines.com is correct, Amazon is launching something big -- ProductAds. Instead of trying to capture all ecommerce transactions on the Amazon.com platform or marketplace, Amazon is now referring transactions to other non-Amazon merchants. Basically, Amazon.com is becoming a comparison shopping engine. Perhaps this is a result from Amazon's recognition that "the percentage of shoppers who started at Amazon has continued to fall, while the percentage of consumers who say they start shopping at a search portal has risen." Given that ecommerce search represents a big portion of Google's Adwords revenue -- and almost 100% of eBay's revenue -- if this takes off, it could have a pretty big impact on the ecommerce world. Wow. My post yesterday got a lot of attention. Techmeme for most of the day. And nice compliments from Fred, Bijan and Alley Insider. Unfortunately, I probably should have named my post "How to lose fans and (falsely) influence people". While I still believe in my conclusion (that a coming exodus of Yahoo and Microsoft employees will benefit startups), I think that my experiment was flawed. Apparently, when I set up the ad campaign, I checked a box that said "Add Social Actions to my Ad" - and guess I didn't fully understand what that meant. That box apparently adds a Facebook picture to my ad - in this case, the picture of Yahoo and Microsoft employees who had previously joined the First Round Capital group. I had no idea these pictures were running -- the only thing I saw in the Facebook Ad Control panel was the ad (right). And since I'm not an employee of Microsoft and Yahoo, I never actually saw the ad running. Anyhow, I've now been informed (loudly) that my ad which said "Leaving Yahoo?" was accompanied by a picture of a current Yahoo employee. Most of those employees joined the FRC group before the ad campaign -- and (obviously and justifiably) were not too pleased by any implications that they were leaving their employer. And while I've apologized in person to those that contacted me, here's a very public apology to those who haven't. Earlier today, I read your post on the social ads experiment. I agree that it’s an interesting polling mechanism to judge the mood of folks at Y! or Microsoft. But I want to offer an alternate / adjunct explanation to the reason behind the rise you are seeing in CTRs. The ads are shocking. Social ads were designed as an endorsement. By becoming a fan of a business, I lend my likeness to the business and allow them to promote their products and services to my fans. It most instances, this would have a purely positive connotation. For example, if I were a fan of BMW my likeness might appear alongside a Newsfeed ad which might read “The Ultimate Driving Machine.” The ad tagline is generally positive and straight forward. 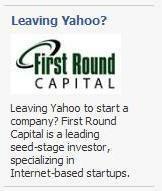 In the case of the ads you designed (attached), my face appears alongside a tagline, “Leaving Yahoo!?”. To the casual eye, the ad tagline reads as if it could be reporting a rumor that I am leaving Yahoo!, or that I have already left and that I am recruiting for a start-up. The negative connotation of the ad design introduces the potential to elicit responses of surprise and shock – not necessarily directly related to employee satisfaction. In fact, if the clicks on the ads are driven by “surprise and shock” it may also provide an explanation as to why the Microsoft CTRs were higher than the Yahoo CTRs. It could be that people at Microsoft were more surprised than Yahoos to see that their colleagues were leaving the mothership. An interesting experiement in social ads and a good lesson for me about the twists and turms related to Beacon and passive endorsements. I don’t want my colleagues to think I’m leaving Yahoo, so while your experiment is ongoing, I’ve pulled my “Facebook fandom” for First Round Capital, but I very much remain a fan! I know that your experiment was done with the best of intentions. You should keep doing them! Afterall, if we can’t be fascinated by this industry (and maintain our sense of humor) it’s time to move on. We’re all still learning about Beacon and social ads in general. 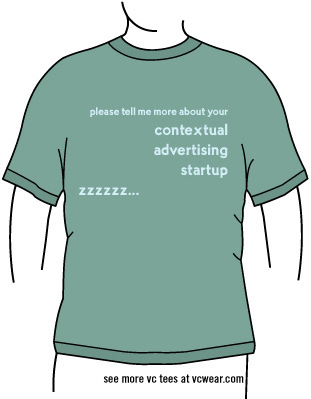 It’s a really powerful concept, but I think there we’ll discover a line between implicit and explicit endorsements. So, here's a belated apology to all the Yahoo and Microsoft employees for their unanticipated role in my Social Advertising experiment. I feel kindof like the guy who's girlfriend found out about their Christmas gift through Facebook beacon. I've stopped running the ads -- and welcome back all our fans. As people begin to deploy Social Advertising it's sure going to be interesting to think of the unanticpated consequences. For example, assume I’m a “fan” of Nike. Nike decides to run a New Year’s Resolution promotion, with the tagline “Get in Shape This Year!” Would my friends think that I was telling them to lose weight??? Updated - See new post for more info. Back in November, Facebook launched their new SocialAds platform. Like many other folks, I decided to spend $50 to check out the platform. Like Fred, I decided to advertise for my fund - First Round Capital. Unlike Fred, however, I decided to test Facebook's targeting mechanism by running targeted ads to employees of large Internet companies -- including Yahoo and Microsoft. One of the nice parts about Facebook's platform is their realtime statistics. Back in November, I saw that my Yahoo ad received 21,291 impressions with only 64 clicks -- a clickthrough rate of 0.30%. And my Microsoft ad received no clicks with 1,058 impressions. So when Microsoft announced they wanted to acquire Yahoo, it got me (and everyone else) wondering. Specifically, I wondered if YHOO/MSFT employees were indeed more likely to "look around" for new jobs -- and if so, how much more. Since I had baseline data from just 90 days ago, I decided to run the ads again. 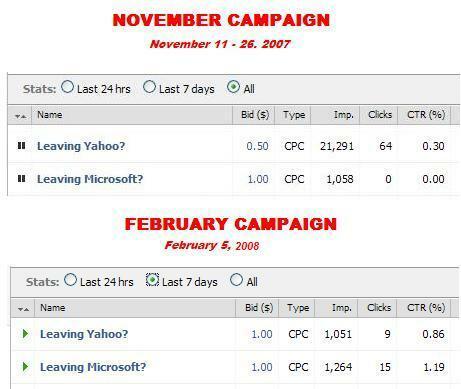 On the Yahoo side, there was a 260% increase in clickthrough rate -- from 0.3% to 0.86%. That is not surprising. But on the Microsoft side, I was really surprised. When I ran around 1,000 impressions before, the ad did not receive one click -- now the same advertisement received 15 clicks. Microsoft's clickthrough rate increased from 0% to 1.19%. Maybe it's not just Microsoft's shareholders who are unhappy. I acknowledge that this data is probably not statistically significant -- however, it probably is a good leading indicator of the exodus that will occur. And, while there has been a lot of discussion of whether a Microsoft/Yahoo combination would help or hurt Silicon Valley, the impact of this coming exodus has been largely ignored. As talent leaves the big Internet/technology companies, there will be a flood of experienced folks looking to join (or start) startup companies. And that's a flood I look forward to.